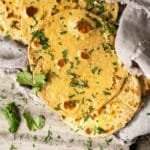 This simple gluten free and keto naan yields killer results! Expect a sturdy, pliable and ultra tasty flatbread (courtesy of the yeast! 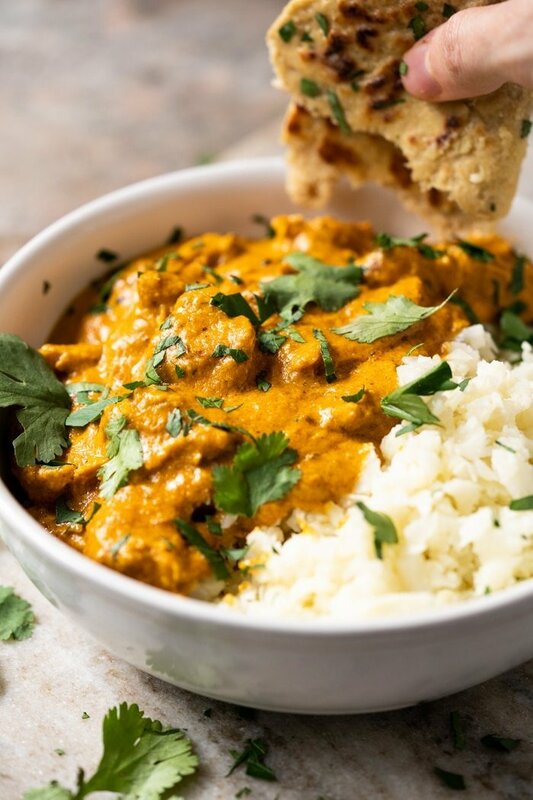 ); ideal for any and all low carb Indian dishes (think butter chicken!). 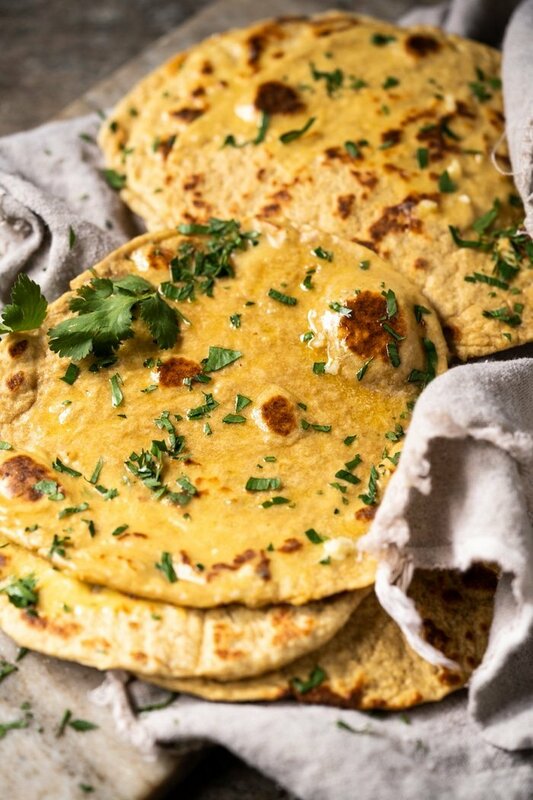 This keto naan (or flatbread?!) is an awesome and quick way to incorporate some ‘bread’ into your busy lives. 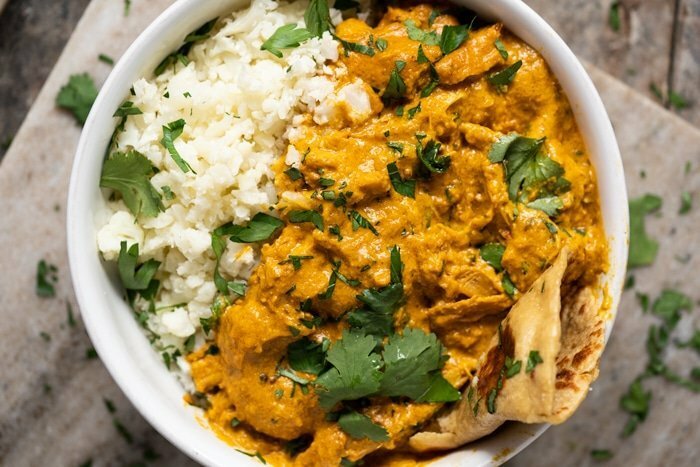 Needless to say, they’re terrific with Indian curries such as our butter chicken; but feel free to use them as wraps, toasted into croutons, and so on. I’ve also tested it with a variety of flours (see section! ), so you guys will be able to adapt them more readily to suit your needs. But whatever you, give them a try freshly made with garlic butter and a touch of coriander; simply sublime! –Oat fiber puffs up the most and has the best texture out of the lot, arguably as it is a grain… having said that, I’ve been testing it in small quantities for a few weeks and haven’t noticed any inflammation (and I know many of you are big fans!). Oh, and the neat thing about oat fiber is that it’s virtually carb-less (I’m assuming there’s a trace, but labels read 3g carbs – 3g fiber = 0 net carbs!). For visual comparison in the picture above, the oat fiber naan is on the left. Also keep in mind that brands vary a lot here and Lifesource seems to be the best (no weird aftertaste, etc). – Finely ground golden flaxseed meal doesn’t quite puff up (it’s on the right in the picture), but has a truly lovely texture and taste. Also, keep in mind that a touch of xanthan gum is non-negotiable I’m afraid; as it binds it all together (i.e. replaces the gluten). 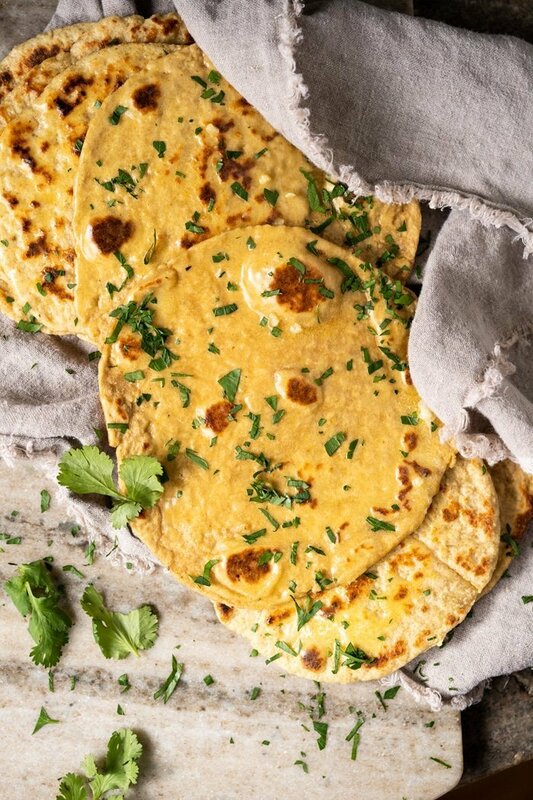 These low carb naan are as easy to whip up as our famous keto tortilla recipe (fact is, they’re directly inspired by it!). So you simply proof the yeast, pulse all the ingredients together in your food processor or in your stand/hand mixer, let the dough rest for thirty, roll it out and cook it up. 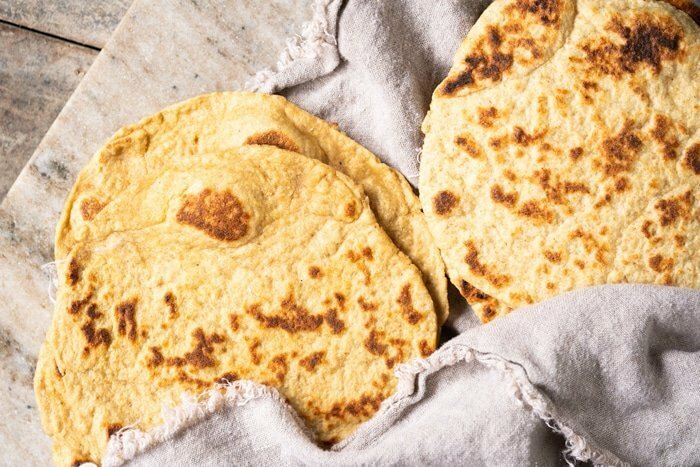 This simple gluten free and keto naan yields killer results! Expect a sturdy, pliable and ultra tasty flatbread (courtesy of the yeast! ); ideal for any and all low carb Indian dishes! Proof the yeast by mixing it with the inulin (or touch of sugar!) and lukewarm water in a small bowl or cup. Cover with a kitchen towel and allow to rest for 7 minutes. The mixture should be bubbly, if it isn't start again (too cold water won't activate the yeast and too hot will kill it). Add almond flour, oat fiber (flaxseed meal or coconut flour), xanthan gum, baking powder and salt to food processor. Pulse until thoroughly combined. Pour in the apple cider vinegar with the food processor running. Once it has distributed evenly, pour in the egg. Stop the food processor and add in the yeast mixture (it can't really be 'poured in'). Pulse a few times until the dough comes together. The dough should be sturdy, but sticky to touch. Form into a ball, cover with a kitchen towel and allow to rest in a warm draft-free spot for 30-60 minutes (you can leave it in the food processor or transfer it to a clean bowl). You'll notice the most rise out of the three flours with the flaxseed meal, but what's important here is the taste and aroma from the yeast. Wrap the rested dough in cling film and knead it through the plastic for a minute or two. Think of it a bit like a stress ball. Divide the dough into four pieces. 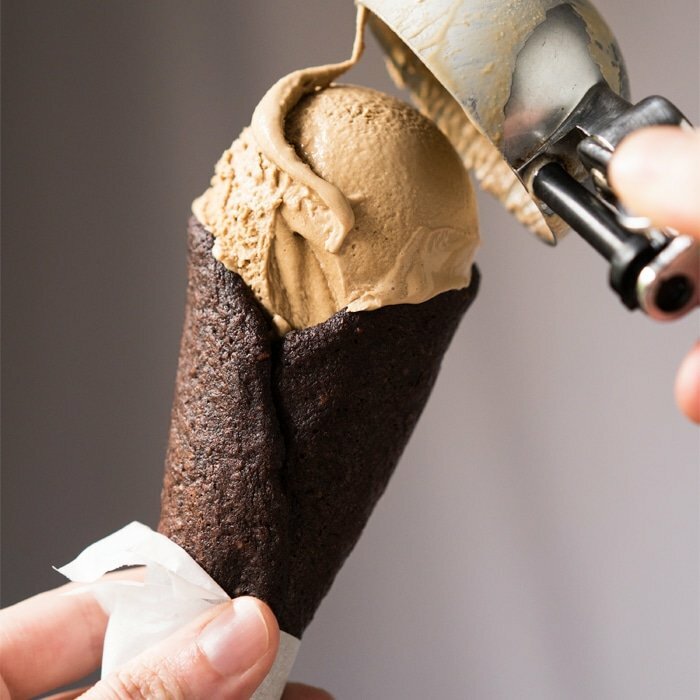 Roll out between two sheets of parchment or waxed paper with a rolling pin. Feel free to play with different thicknesses here; though keep in mind that, in my experience, thinner naan cooks best in the stovetop while thicker one in the oven (perhaps a no brainer?!). Heat up a little oil (butter or ghee), add the rolled out naan and cover immediately with a lid. Depending on your heat level, you'll want to cook the naan for 30-40 seconds on each side, until lightly charred and bubbly. Preheat oven to 400°F/200°C with an oven-proof skillet or pizza stone while the dough is proofing. Similar to the stove-top method, you'll want to cook the naan on the hot skillet in the oven for roughly 30-40 seconds on each side until lightly charred and bubbly. Brush with garlic butter and garnish with coriander. These naan are best eaten straight away, but they do rewarm surprisingly well! *You can feed the yeast with either inulin or an actual sugar (thanks for the inulin tip guys!). And do remember that the yeast will feed on such sugar to emit carbon dioxide, so it doesn’t affect the carb count. And please note that nutrition facts were estimated using the oat fiber (just 3g net carbs!). With the coconut flour and flaxseed meal they're roughly 4g net carbs each. Wonderful to hear Sandi thank you! xo! Any answers yet on using Psyllium Husk instead of Oat Fibre? I’d like to make these tonight and it sounds like the Psyllium might work but I’d love to know in advance! I haven’t tried yet, but I know some readers have used it in the tortilla recipe which is similar.. and since flaxseed works too I don’t see why you wouldn’t get solid results (but cannot guarantee!) xo! Awesome to hear Lorelee! Its better to make then and they do freeze quite well 😉 xo! Have you tried psyllium husk? I have that on hand. Made naan over the weekend with coconut flower, coconut oil, psylium husk. It tasted very mealy and wasn’t sturdy. Look forwarded to trying your recipe, not sure I can find oat bran. Does Red Mill have this? Made these btw… they totally rocked! Have you tried Psyllium Husk instead of Oat Fiber in this recipe by chance? Would that work at a 1:1 sub ratio? Thanks for this recipe. I made them last night and they were tasty, but although the dough rose very well I could not get them to puff up. I tried again today and doubled the recipe, as its alot of work for just 4 nann. Still no puff, I tried experimenting with my little convection oven for the last 2….but no puff. I did have a break through., instead of rolling them, I successfully used a tortilla press, and they were the perfect thickness. Thanks again. I just want to say that I absolutely love this blog! I was really worried about going keto because I absolutely LOVE bread and sweets. This blog truly has saved my new lifestyle. I don’t think I would have had lasted without it. Everything I’ve made so far has been delicious. Even if I messed up it still turns out great and I learn for the next time. Thank you so much Paola and Gnom-Gnom! Awww wonderful to hear Amber thank you! It’s my absolute pleasure! And I’m with you, gnom-gnom was born because I missed sweets waaaay too much when placed on keto for medical reasons 😂🙈! Paola, do you think the cooked naan could be frozen and warmed later? Thank you so much for your recipes. You make staying keto so much easier! Hi Paola 👋 This is more of a general question. Do you find that out fiber is a good 1:1 substitute for coconut flour in recipes? I’m sure there are variables that probably make this challenging to apply in all instances. Sometimes I don’t care for the grittiness of coconut flour. It’s not off-putting. I’d just like to have a smoother texture in my baked goods sometimes. Just as I suspected. Thanks for your perspective. Maybe I’ll play around with the oat fiber a bit more, see if I can make any sense of the ones I have. I usually like Anthony’s products but their oat fiber was terrible. It’s brown and a bit bitter. I don’t want to waste it so I’ll use it in recipes with stronger flavors. I think I ended up buying Trim Healthy Mama to replace it. Much better! I tried the Trim Healthy Mama in one of those mug biscuit recipes and it was fantastic! The product is white and not bitter at all, unlike the Anthony’s. I wonder if I just received a bad batch of the Anthony’s. I haven’t had an opportunity to try THM in a more substantial dish yet. When I do, I’ll be sure to let you know how it goes. Oooh good to hear!! Thanks so much for sharing Lisa, I learn SO much from you guys!! NuNaturals oat fiber is terrific. I believe I bought it from vitacost🤗 Thanks for all of these recipes, I’ve made a few and book marked tons! The only one that puffed was the very last one that I cooked. I only let the dough rise for 40 minutes before rolling, though. Next time, I’ll let the dough rise for a full hour. My hubby and I still enjoyed the heck out of these, though! it’s probably because your pan was hot enough by the last one Christy 😉 it’s the heat that makes them puff! xo! Got to clarify this for myself: is oat fiber the same thing as oat bran? If not, are they possibly interchangeable? Can you produce oat fiber from the bran? Mmmm I don’t know?! What is the carb count in oat bran? Oat fiber has 0, this could help see if they’re the same thing xo! I made these for the first time today and they were very tasty. I rolled the first one too thin and had a hard time getting it off the parchment as it was quite sticky. I made the rest smaller and they were easier to handle. Yours look quite large in the pictures but mine turned out only about 4 inches in diameter. Is that about right? I used the 2 tablespoons of water from the recipe and I’m afraid if I use less water, the yeast won’t proof properly. Maybe I could try adding a little more almond flour. If they weren’t so sticky, I think they would roll out to the right size. Guess I’ll have to make them a few more times!! I make a lot of regular (gluten) bread for my husband and have the same problem. I think the humidity level in the house makes a difference too, since my bread is always less sticky in the winter when the house is drier. Paola, you are a wonder! I’ve so been craving naan! Might make some tonight! 🙂 Thanks for all you do! It’s my pleasure Christy!! xo! So excited to get this to work. Sadly the first attempt was way too wet to work with, so I’ll have to give it another go because I really want it to work! Hi Annie! Sounds like it just had a little too much water (could also be using an extra large egg). This can also happen with different brands having different absorbency etc, but I did find this recipe to be fairly easy going so I would just add a little less of the water next time xo! Do you know if the dough can hold in the refrigerator or freezer for a day or two before cooking/baking? Good question! Tbh I haven’t tried? I have noticed that it doesn’t work with the other yeast doughs (the bread etc), but it could work with this one… I’ll have to give it a try! xo! I’m wondering, my old gluten-filled naan used yogurt instead of water for the liquid component. Is there enough sugar in plain yogurt to feed the yeast? Would it be a wasted batch of ingredients to try subbing in yogurt for a richer naan? So glad to have found your site. Life-saving for this new LC acolyte. My inner foodie was dying. Hi Sarah! 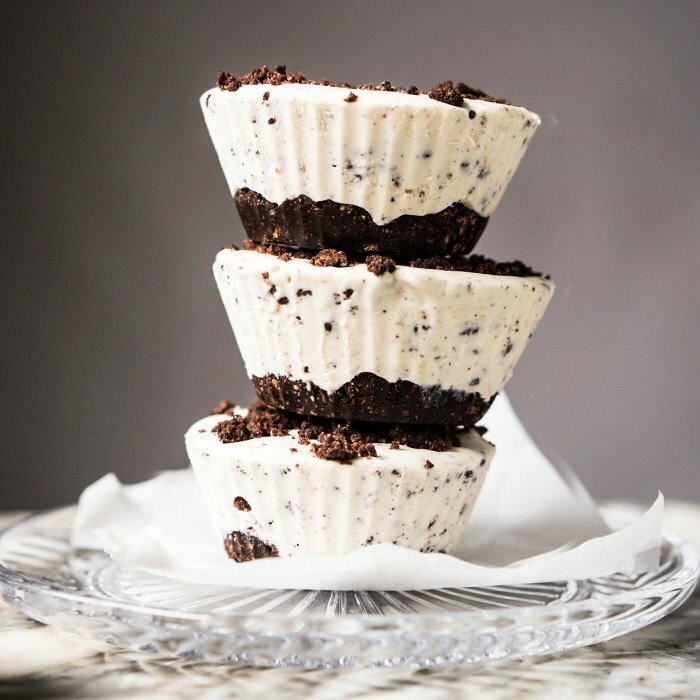 Sometimes I’ve found it best to stray away from tradition when it comes to keto baking (yogurt didn’t quite work for me here) xo! I gotta say you have a privileged mind to come up with these ground breaking recipes! We used the oat fiber and they taste and feel just like a flatbread, its outstanding! Do you think they would crisp up a bit to become a pizza base?! Bless you for all that you do. Claire & Andrew how lovely of you thank you for the blessings 🙂 So happy to hear you’re enjoying the recipes so much! Would this work with sunflour seed flour for an almond allergy? Hi AB! Tbh I haven’t tried (just not something I find in Mexico easily! ), BUT I know that the tortilla recipe works great with it (and this is a spinoff with yeast) xo! Just reporting back – these didn’t look pretty but they tasted FANTASTIC with the sunflower seed meal!!! 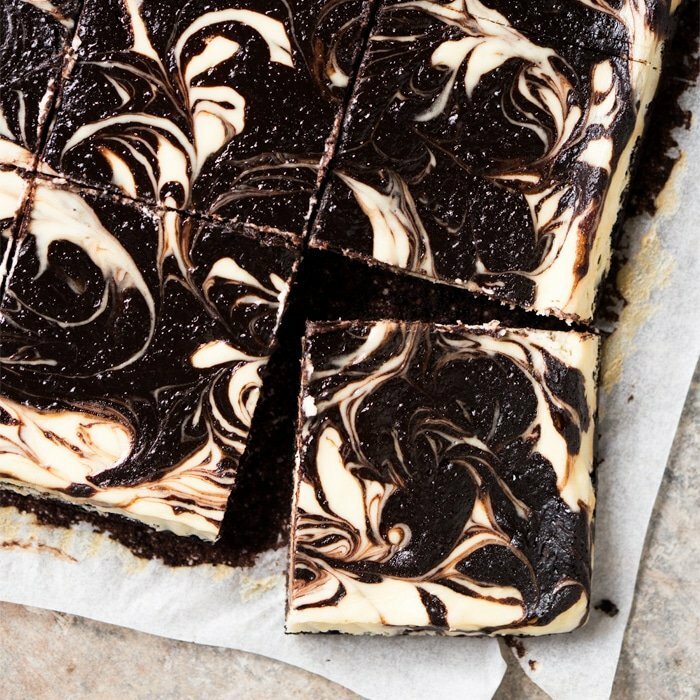 Thanks so much for posting this recipe! Been making these everyday for the last four days!!!!!!! Do you have any experience with any make ahead and keep tips? The dough I imagine would be hard but if they are rolled and cooked would they freeze well? Or refridgerate well? or does the texture get ruined? We made these last night with butter beef (we didn’t have chicken) and zoodles, OMG they were so good!! We followed the recipe exactly with the oat fider, they were perfect! I rolled the first one way too thin, but the other three, won over my non-keto special one with one bite! Thanks Paola! As always, your recipes are just fantastic!! Renee that’s super awesome to hear! And I get you on the thinness, you need to play around a bit (but I also think it lends itself to the dough being used for other fun stuff!) xo!! have you tried subbing oat fibre with oat bran? Any thought on substitutes for people who can’t eat eggs? They’re absolutely delicious thank you!! I don’t have a kitchen scale. How do I convert gram to cups? Thank you so…much. Can’t wait to try them. One more word, PANCAKES!? I would think this could sub for some awesome individual pizza base too? Sarah that’s so wonderful to hear! Hope the hubby loves the naan too! xo!